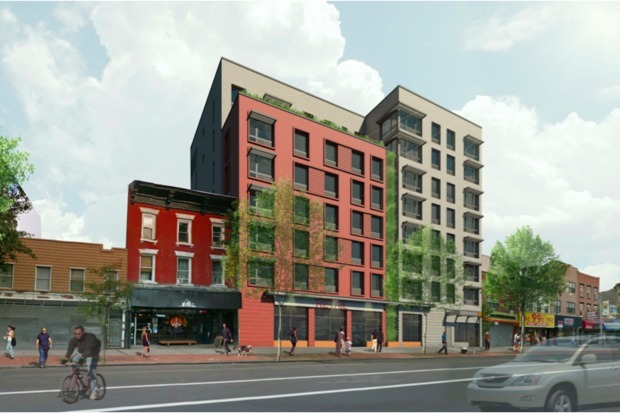 Renderings for 695 Grand St., an eight-story affordable housing building proposed by St. Nicks Alliance. WILLIAMSBURG — Score a subsidized apartment on the bustling Grand Street starting at $670 in a new building with an outdoor garden and a community room. Thirty-eight apartments are now up for grabs at 695 Grand Street, in a new building being built by local nonprofit St. Nicks Alliance, that's two blocks from the Grand Street L train stop. The apartments range in price between $670 to $1,899 based on income levels and family size. Families of four earning between $28,620 and $124,020 are eligible to apply. There are seven studios, eleven one-bedrooms, fourteen two-bedrooms and six three bedroom apartments available. Building inspectors have cited the project's contractors, Galaxy Contracting Corp., four times this year for unsafe conditions on the site. The company owes the city $3,700 in open building department fines for failing to have guardrails to prevent falls, workers spotted on unsafe scaffolding without harnesses and other violations, records show. "DOB came saw an issue, we heard about it immediately, we met with them the contractor responded right away," said Frank Lang, the housing director at St. Nicks Alliance. The apartment building will be 100 percent affordable, and 12 apartments will be set aside for formerly homeless families, he said. St. Nicks Alliance has been involved with the property since the 1980's when the city paid them to develop it into a commercial building. Most recently the former one-story building housed a Rainbow clothing store. "At first those two buildings helped to strengthen the commercial part of Grand Street 1985," he said, adding that the new apartment building will also have commercial tenants on the ground floor though they haven't picked them yet. They're hoping to finish the building by the end of this year and begin filling apartments in the early months of 2018, he said. Applications to live in the building are due by Dec. 29. You can apply online through the city's housing lottery or by mail. 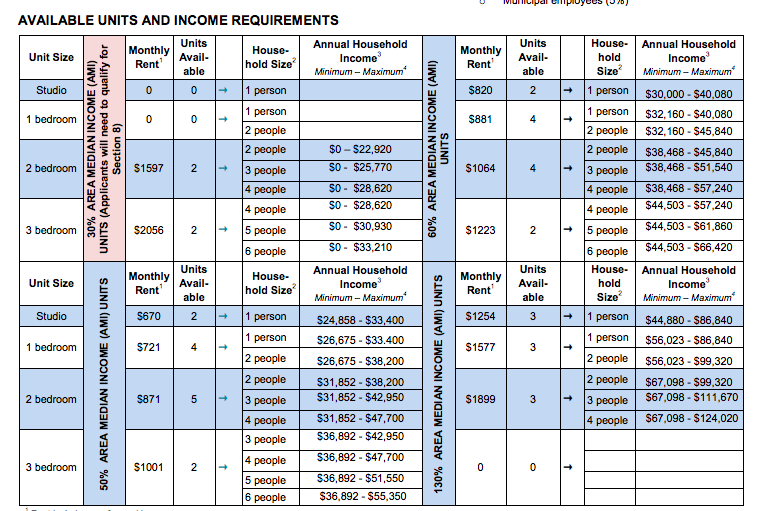 Here's a full list of monthly rents and required income.